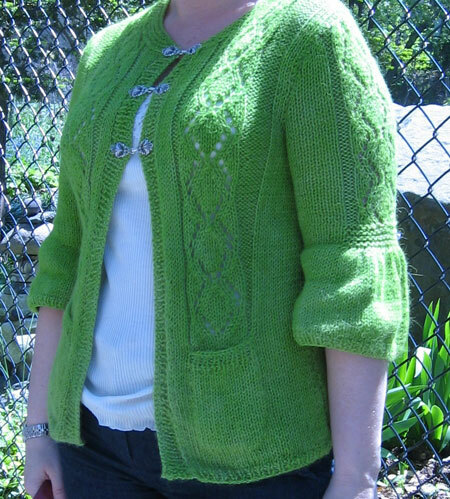 I know, imagine this – an actual post about knitting. 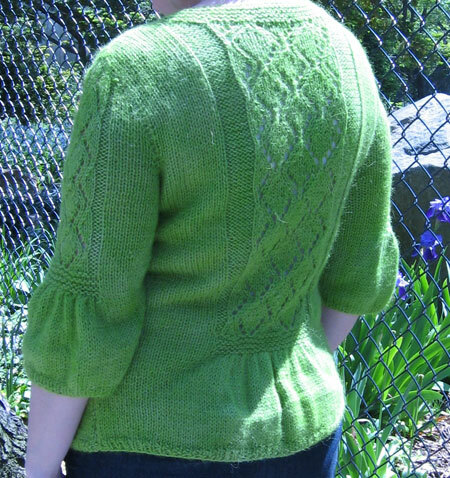 I *finally* finished the Lush and Lacy cardigan and wore it yesterday. Overall, I am really happy with how it came out. I know that I took a big risk by dyeing a whole garment rather than just yarn. Even more so that it was my first dyeing experience. As predicted, the initial results did come out a bit spotty. But I was fine with not having a uniform color – I didn’t mind some variegation as I felt it would look hand dyed and that’s ok – it’s just the old ugly color showing through looked somewhat brownish against the new bright happy green. My solution – mix up more Kool Aid in a glass – take an old pastry brush – go over spotty areas – microwave 2 minutes to set the color. I did this a couple of times, and I’m completely satisfied with the result. Yarn used – Elann Pure Alpaca in a dull grayish green that depressed me. 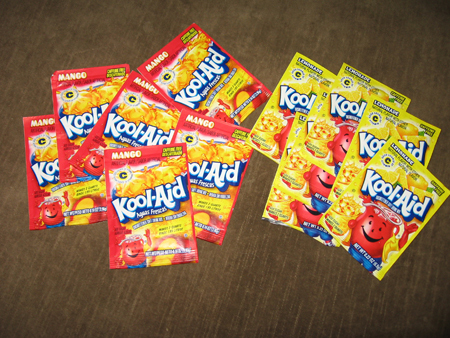 Kool Aid used – Lemon Lime, 50 packets purchased, maybe 30-35 total used. Excuse the cropped shots, we were not looking our best yesterday. This sweater makes me happy. 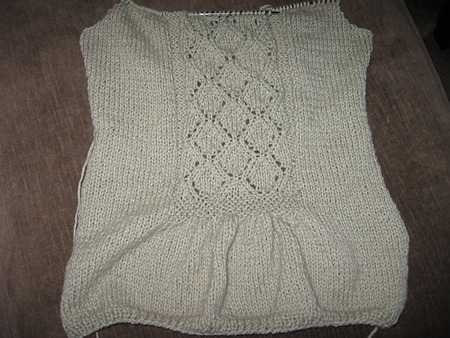 Finishing a deadline late last week meant that I could get in some knitting on the weekend, and I’m nearly done with the back of the Lush and Lacy. I’m not sure what I’m thinking, knitting a Spring sweater out of alpaca (I tend to be warmer than most people), and I’m still not loving the color, but Michelle gave me the idea to dye and I think I will. 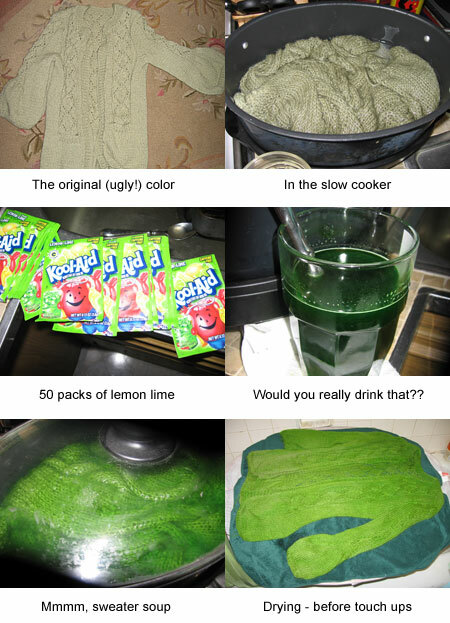 I want to dye it with Kool Aid since I want a bright happy color anyway, and I’d rather use something fairly non-toxic as I don’t have any big extra pots and I don’t care if I dump this in a soup pot, it’s food after all. I had already started the sweater, so instead of dyeing yarn skeins I will be dyeing knit pieces (before sewing) – anyone have any good luck with kool aid and dyeing complete garments? Now the problem is what color, and finding the Kool Aid. Seems every store in my neighborhood carries only the sweetened kind but I managed to find the packets of only 2 flavors in a local supermarket. Not the ones I’d hoped for, I wanted blues or greens, but you know yellow and orange are the colors for Spring around here. I bought a few packets to experiment before picking a color. If they turn out awful on the pale green, I might have to resort to Ebay to get other packets. Looks like a dyeing experiment might happen around here tonight, folks.